If you’re thinking about getting new countertops in your kitchen or bathroom, there’s a good chance granite’s on your shortlist of options. After all, it’s one of the most popular materials used in kitchens today. Before you choose your new countertops, here’s what you need to know so you’ll know if they’re right for your remodel. Probably the first thing most people want to know is how much they’ll cost. 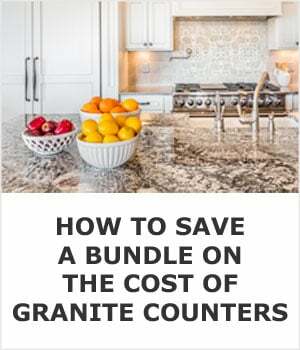 While the actual answer varies based on several factors (where your slab is coming from, the quality of the stone, the retailer you use), you can get a rough estimate on just how much your new granite countertops will cost you. The average cost of granite countertops is $75 per square foot. Slabs can cost anywhere from $40 per square foot to $200 per square foot to fabricate and install. These figures include the actual cost of installation and the fabrication costs as well. The cost of the countertops can be kept down by using thinner slabs and using remnants, though this will likely mean that you’ll have more seams if you have a large kitchen. Start by checking out local family owned stone yards in your area. Most will display full granite, marble, and other stone slabs in their showroom so you can see the actual slab that will be used in your kitchen. Choose a retailer who sells, templates, fabricates, and installs the countertops themselves. This just makes it easier to deal with any problems that come up during the installation process since the granite company will oversee every step of the process. Try to avoid big box stores like Home Depot. Not only is the variety of their stone limited, but they contract out the work as cheaply as they possibly can. Opt for a local independent retailer. Buying local can also help keep your costs down since retailers have to factor transportation costs in when they give you a price. Variety is endless! This is just a small sample of the colors you'll find locally. Always ask to see the actual slab that will be used in making your countertops, not just a sample, and especially not a photograph of a sample. Granite colors and patterns can vary greatly from slab to slab and you’ll want to make sure that the one you choose suits your kitchen. Look for any obvious signs of damage or weakness (chips, fractures, cracks). Not all ‘flaws’ are a problem, but some could make the slab structurally weak or you just might not like the way they look. 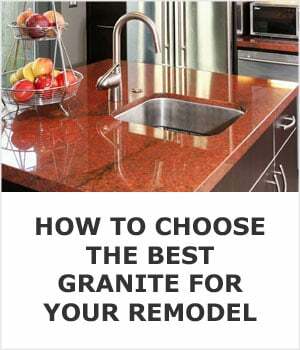 Ideally, you’ll buy your granite from a place that also fabricates and installs the countertops. Your fabricator should be skilled in design as well as fabrication so that they can cut the stone in such a way as to minimize seams and the keep the pattern of the stone facing in the same direction. Look for someone who’s been in business for a long time and don’t be afraid to ask for references as well of samples of their previous work. Many keep photographs of their previous projects on hand so you can see just how good they are at their jobs. Don’t be afraid to ask to see these, too. Yelp is a fantastic resource to hunt down local businesses. Another way to save money and still get the look of natural stone is to use granite overlay countertops. Overlays are a thin slab countertop that is designed to fit over your existing counters. You don’t have to deal with the demolition and mess of removing your old kitchen work surfaces. They install fairly quickly and cost less than traditional countertops, but they aren’t as durable as traditional options. If you have a small kitchen, or if you don’t mind a more eclectic look, you can save money on your counters by using granite remnants. Often, large pieces of slab are left over from previous job and instead of throwing out these remnants, retailers will sell them at a lower price. 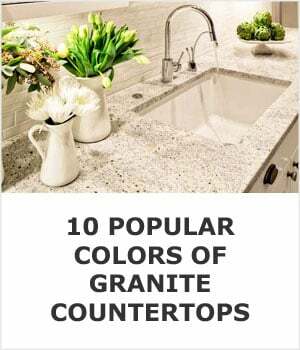 You may be able to piece together a small kitchens worth of countertops using only remnants, or you may get enough to add granite to your bathroom vanity. Make sure you’re using a great fabricator if you use remnants. You really don’t want the stone pieced together in any old way or it will look cheap and you may have more seams to maintain. You can still get a great countertop using remnants, but it may take more patience to find just the right slab. Many home improvement chain stores have samples of granite you can take home to play with. Most local retailers will also have samples you can take to see how the stone looks in your home. Often times they will use a hammer to knock a corner off of a slab you are considering. If you can, take a sample and see it in ‘real time’ in your kitchen or bathroom. A stone can look completely different in the store than it may in your home, so don’t commit to buying an entire slab based on viewing a picture of it or a sample in a similar pattern and color. Granite only looks amazing if you take care of it. Yes, it’s sturdy–one of the most durable materials used in kitchens, in fact–but if you aren’t careful, your beautiful expensive work surface could wind up looking like cheap junk after a few years. Fortunately, caring for it is not difficult to do. No guarantees, but you may actually smile after a proper cleaning that restores the deep shine. 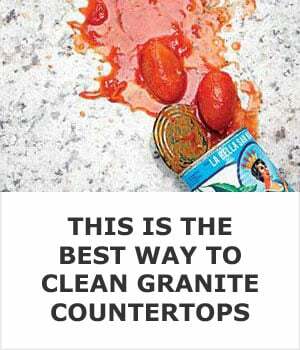 It doesn’t take a fancy cleaner to clean your granite countertops. In fact, warm, soapy water will usually do the trick. However, there are a few caveats to cleaning them. First, make sure you’ve sealed them properly once they have been installed. This prevents moisture from seeping into porous stones and leaving permanent stains. Never use an abrasive cleanser. This will leave scratches and damage the surface, leaving it even more vulnerable to stains and germs. 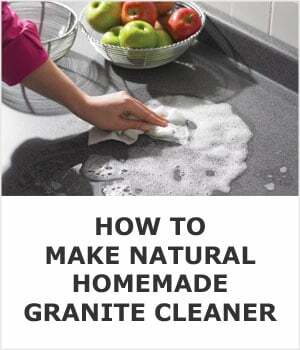 You can buy special granite cleaners, but it’s not really necessary. Whatever you use, remember to wipe the countertops dry with a clean microfiber cloth when you finish to prevent moisture from sitting on the surface for too long. If you’d prefer to use a cleaner made just for granite countertops, there are several good ones available. You can find these online or at most big hardware stores. Your fabricator may even provide you with some after they’ve installed your new countertops, if you’re lucky. Although hot water and mild dish soap are adequate for daily cleaning, you can buy pre-mixed cleansers designed specifically for everyday sanitation. Method makes a cleaner that comes in a spray bottle for easy application. ‘Granite Gold’ is another cleanser with good reviews and a solid track record as an efficient, gentle cleanser. Reviews often mention the pleasant smell too, which is a plus if you’re using it every day. Trinova, Black Diamond, and Weiman also appear on the list of popular choices because they have been shown to clean the stone thoroughly with no residue or lingering bad odors. Sealing your granite countertops will protect them from stains and discoloration. Many times the fabricator or installer will seal it for you when it’s first installed, but you’ll need to reseal it occasionally because it does wear off over a period of months. It’s best to use a sealant that’s in the product class known as impregnating. These seep into the stone, improving its’ level of protection and durability. Each sealant manufacturer’s instructions may vary, but regardless of which type you use, clean your countertops first with either granite cleanser or soap and water. Once the stone is dry, apply the sealant per the instructions, then let it air dry. Once it’s dry, apply a second coat. You may have to repeat this in six months to a year, or you may be lucky and not have to do it for longer than that. There are several brands of sealant you can buy for your granite countertops. The best ones are those that don’t have to be reapplied frequently and that do a good job of blocking out moisture and bacteria. Some come in spray bottles, which can be convenient if you control the spray and contain it just to your countertops. One brand that gets positive reviews is the Bulletproof sealant from StoneTech. It’s a heavy duty sealant that wipes on so it’s easy to control the coverage. It can be used on other types of countertops, too, and is durable enough that you shouldn’t have to re-seal the countertops too often. Sealants that penetrate the porous surface of granite are ultimately the best type. That’s probably why the 511 Impregnator sealant seems to get many good reviews. It doesn’t discolor the stone and it penetrates deep into the pores to provide a durable coverage that blocks stains and prohibits bacterial growth. Although it’s very hard and durable, granite can be damaged through daily use. Dropped pans, errant knives, and family members sitting on them (cabinets can take the weight but not counters) can lead to chips, scratches, and other unsightly bits of damage to your stone surfaces. Fortunately, for most minor damage, there are DIY repair kits readily available. Most repair kits include some kind of gel for filling in small holes and sandpaper for smoothing the surface once the gel has been set. Light curing acrylic gels are applied, smoothed, then cured with a special light included in the kit. Cracks may be repaired by using an epoxy resin to hold the two pieces together. An acrylic filler can then be used to fill the top of the crack, making the surface look and feel as good as new. Make sure that if you buy a stone repair kit you buy one specifically for granite and follow the instructions carefully. You can cause more damage than good if you aren’t careful with these products, so take your time and consult a professional if you aren’t sure about what you’re doing. Due to granite’s porous nature, stains can be a major problem, especially if you don’t seal them. Even water can discolor the stone if it’s left for too long, so it’s important to know a little about stain removal before you ever need to use the information. Luckily, many stains can be removed using items you probably have lying around your home already. By creating a poultice using flour and a wicking agent, you can pull many stains out of your granite and make it look as good as new. Start by making sure that you’ve cleaned all the food off the countertop. Then make a paste of flour and hydrogen peroxide. Apply the paste to the stain and cover it with plastic wrap. Use painter’s tape to hold the plastic wrap down and keep the poultice from drying out too quickly. Let it sit for 24 hours, then remove the wrap and allow the poultice to dry completely. Once the poultice is dry and crusty, scrape it off with a plastic scraper or spatula, then wipe the spot with a damp cloth. You may have to repeat this process if the stain is stubborn, so be patient. Oily stains can be trickier to remove. Use acetone and flour or baking soda to create the poultice, then follow the same steps used for removing food stains. You can use bleach to remove stains left by mold or mildew. Just be sure to reapply sealant after you’ve used any stain removal method so you can prevent future stains from occurring. Granite is often compared to other materials when people discuss choosing stone for countertops. Quartz is probably the most popular comparison. They do have some similarities–they’re both hard, both fairly heat resistant–but they also have some differences worth discussing. Granite is a natural stone that is dug out of the earth and cut into slabs to be used for countertops and tiles. Quartz is made from around 97% quartz and 3% resin which is added as a binder to hold the quartz together. Quartz counters are not as heat resistant, so if you plan on placing pans right from the oven on them, use a trivet. Granite makes for a very hard countertop, which isn’t always a good thing, especially if you take cast iron out of your cabinets a lot. Quartz is actually stronger, made to be just as hard with a little more flexibility to prevent chipping. Quartz isn’t porous at all. This is because of the resin it’s made from and it means that the material is both stain resistant and resistant to bacterial growth. 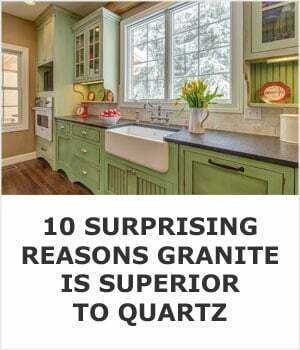 On average, quartz does cost more and although granite countertops needs to be sealed, it does tend to have a more unique look than quartz, which is designed in a lab rather than by Mother Nature. At the end of the day, the two are both great options depending on your needs, preferences, and budget. 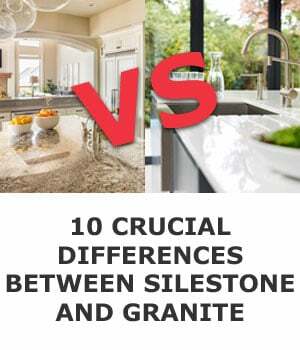 If you are considering quartz, two of the most reputable brands are Silestone and Cambria. Want to dive deeper into the comparison? Here we have an entire page dedicated to granite vs quartz. Quartzite countertops are often confused with quartz because of their name, but they are actually quite different from each other. For starters, quartzite is natural, not engineered, and it began its life as sandstone deep in the ground. Time and pressure transform sandstone into quartzite, a hard, porous rock that’s got a lot in common with granite. Both quartzite countertops and granite are extremely hard. Because they’re naturally occurring, both are quite porous as well and need to be sealed in order to prevent them from staining and discoloration. They can have a similar appearance, too. This is because some of the same minerals are found in both stones in varying quantities. 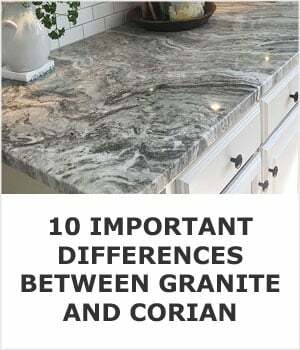 In fact, it can often be easy to confuse the two countertops when you look at them. Quartzite can be more expensive. 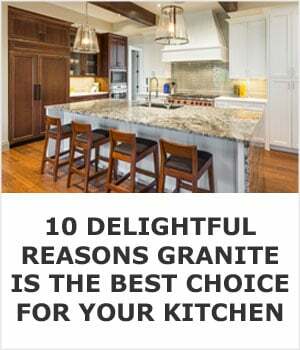 This isn’t always true–some harder-to-find granite colors can be very expensive–but in general quartzite tends to be a little higher priced. Pro Tip: If you don’t like these than quarzite may be a better alternative for you. Often homeowners know they want the look of one type of countertop but they want some of the benefits provided by another. A great example of this is marble. Marble is a classically beautiful stone that is highly sought after for upscale kitchens and bathrooms. However, marble is much softer than granite, so it can be damaged much more easily. Still, that doesn’t have to stop you from having that beautiful ‘marble look’. As an added bonus, granite that looks like marble has a lower price tag and requires less maintenance, so you get more for your money. I'm not sure if this kitchen is modern or throwback, but those are definitely bianco romano counters. Bianco Romano is an icy white option that looks like marble. It has streaky veins of beige and grey running throughout and is a popular choice for kitchens. Due to the light color, it does stain relatively easily and needs to be properly sealed and maintained if you want to keep it looking pristine. If cool white is what you want, Glacier White is probably perfect. It has the same cool coloring as many fancy marbles without being high maintenance. Beige, reds, and pinks are common fleck colors in this particular granite and the creamy base color is smooth and refreshing. It’s a relaxed, tranquil color that’s great for both kitchens and bathrooms. This fantasy white center island looks close enough to marble to me. People looking for something similar to Carrara marble often find that White Fantasy granite fits the bill nicely. It’s got a clean, peaceful look that’s soft and feminine. It has pearly grey veins and is pleasantly on the lower end of the cost spectrum. This particular choice does have a tendency to etch easily, so again, sealing is important and so is keeping exposure to high pH foods to a minimum. Technically, if it etches it’s not granite at all and is probably marble in disguise. Stone yards make mistakes too. Technically a quartzite, White Princess is a countertop that’s mostly white with soft grey veining throughout. The gentle coloration on this makes it popular in kitchens, but it works well in bathrooms, too. Some variations have pink undertones due to the minerals comprising the stone, but mostly it runs a smoky grey color that’s nice and neutral in any setting. While granite that looks like marble is extremely popular, it’s hardly your only option. While you don’t get the same wacky colors as you would in an engineered stone like quartz, you do still get a ton of natural variety. Tans and browns are probably the most common colors simply because the primary minerals comprising granite tend to be in this color spectrum. Ranging from creamy tans to darker, muddy browns, most of these have light and dark veining that provides great contrast. Santa Cecelia is in high demand and has a neutral coloring of mostly cream and beige tones. White granite countertops, like the ones that mimic marble, tend to have grey and tan veins running throughout. New Venecian Gold, pictured above, is an example of a popular light/white with creamy golds and browns. If dark and dramatic is the angle you’re going for, take a look at something like Black Pearl. Its’ dark coloring and bright flecks catch the light and provide plenty of character. Other dark granites can have almost blue or purple veining and iridescent flecks that add movement and life to the surface of the countertop. Whatever color you think you want, go to the retailer and get a sample of the specific stone you’re planning to use in your kitchen. Overhead lights, natural sunlight coming in through windows, and even the size of your kitchen can greatly impact how the countertop looks once it’s in place. Nothing beats seeing the sample in its future surroundings if you want to find a color that’s perfect for your home. Not convinced? I understand. There are a lot of other options out there to choose from. Let’s have a look at how granite stacks up against quartz and for good measure let’s take a quick peak at budget friendly laminates too. They’re amazingly durable and cost less than half of what stone does.